New York - April 8, 2019 - BBC AMERICA has renewed the critically-acclaimed series Killing Eve for a third season. Starring Sandra Oh, Jodie Comer and Fiona Shaw, the award-winning original series is produced by Sid Gentle Films Ltd. for BBC AMERICA. Killing Eve revolves around Eve (Oh), an MI6 operative, and psychopath assassin Villanelle (Comer) in this story of two women, bound by a mutual obsession and one brutal act. The show's second season premiered last night on BBC AMERICA and was simulcast on AMC. The show will continue to pass the baton to a new female writing voice - season one lead writer Phoebe Waller-Bridge handed lead writing to Emerald Fennell (Promising Young Women) for season two, and British writer Suzanne Heathcote (Fear the Walking Dead) is coming aboard as lead writer and executive producer for season three. "We love having this show and the brilliant Sandra Oh, Jodie Comer and Fiona Shaw on our networks," said Sarah Barnett, President, Entertainment Networks for AMC Networks. "Phoebe Waller-Bridge and Emerald Fennell have delivered two addictively entertaining seasons. As we did last year, we're renewing Killing Eve right out of the gate, now with Suzanne Heathcote as lead writer, as a sign of confidence - we adore this show as much as our fans do. Killing Eve doesn't do anything in a templated way; we love giving opportunity to three genius women to make their mark." "It's been such an exciting year for me on Killing Eve. I think it's cool that this tradition has been built into this untraditional show. Inheriting some of Phoebe's characters was a treat - I can't wait to see what Suzanne does next," said Emerald Fennell. "I'm very excited that the Killing Eve baton is being passed onto another incredible writer for season 3. We can sleep soundly knowing these characters are safe in Suzanne Heathcote's hilariously murderous hands," said Phoebe Waller-Bridge. "We are overjoyed at this show of love and passion for the show. And delighted to have another fierce woman at the writing helm. We have been so lucky," said Sally Woodward Gentle. As fans' obsession with season two builds, it's already being embraced by critics with The Hollywood Reporter saying: "it still goes down like a particularly glug-glug-glug-able cocktail, as effervescent and fun and thrilling and smart and witty as ever... ," TV Guide calling it "the drop-dead-funniest yet most suspensefully unpredictable spy thriller in recent memory," and The Guardian saying: "Thankfully, Killing Eve retains the snap-crackle-pop dialogue of season one." 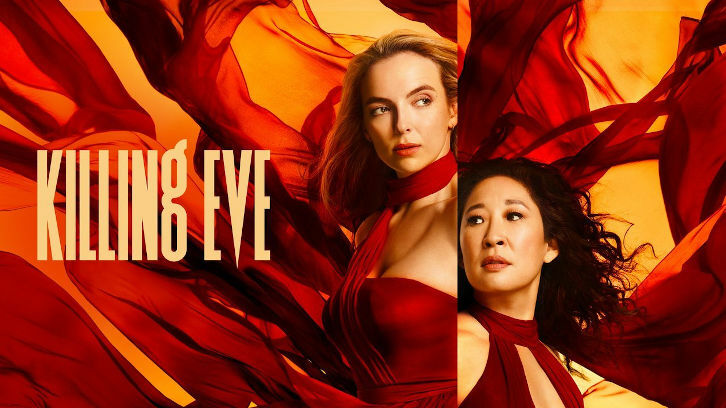 Killing Eve's renewal hits shortly after the series earned 15 BAFTA TV Award nominations, including Leading Actress nominations for Jodie Comer and Sandra Oh, Supporting Actress nomination for Fiona Shaw and Supporting Actor nomination for Kim Bodnia. Killing Eve finished its first season with an unbroken record of weekly ratings growth in the key adults 25-54 and 18-49 demos - something no other show on television has accomplished in the history of Nielsen live+3 ratings. The finale delivered series highs with 1.25 million viewers in live+3, up 86 percent from premiere, with 545,000 adults 25-54 and 378,000 adults 18-49, up 127 percent and 100 percent from premiere, respectively. Killing Eve was the top drama on Metacritic's "TV Shows Mentioned On Most Critic Top 10 Lists - 2018." In its first season, Sandra Oh received the Golden Globe(R) Award, SAG(R) Award, Critics' Choice Award and Dorian Award. Jodie Comer received the Royal Television Society Award and Broadcasting Press Guild Award. Killing Eve received the TCA Award for "Best New Show" and the Gotham Award for "Breakthrough Series." BBC AMERICA's Killing Eve pick-up follows its unprecedented commitment to landmark nature docu-series as the U.S. home and co-producer of groundbreaking series including the upcoming Sir David Attenborough-narrated series One Planet: Seven Worlds, Planet Earth III and Frozen Planet II.